I posted up GNIN last weekend as a short trade watch for Monday or Tuesday. 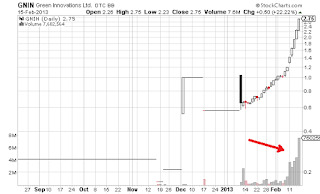 The crash finally came on Tuesday after the stock went supernova all the way over $3.00 a share. 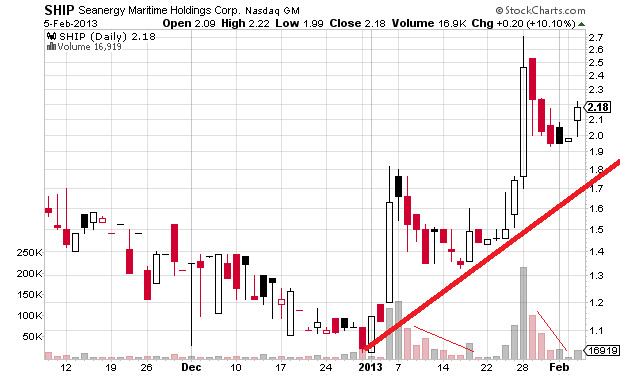 GNIN actually printed $.42 a share today! 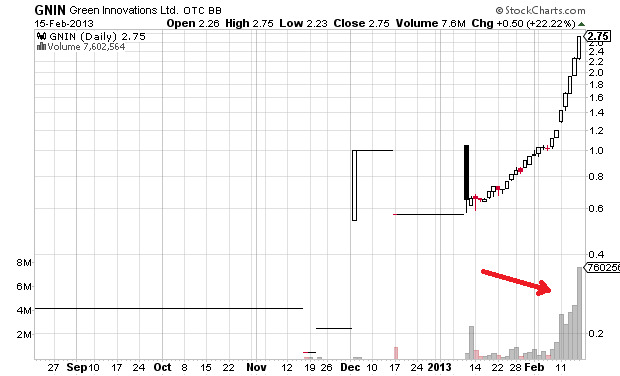 This is a classic pump and dump chart. The volume came in out of nowhere in January and it saw a steady climb that ended in this massive fade. Incredible drop in 3 days. Net-Net BAMM I am currently looking for some net-net's and deep asset value worth writing about. After spending some time going through a stock screen I found Books a Million (BAMM) to be one of the most compelling net current asset stocks I saw for the time being. In looking in the stock market sewers for deep value stocks one can often find somewhat of a diamond like Silver Leaf Resorts SLVF or Adams Golf ADGF were. I'm not sure if BAMM is a diamond but it is something to look at if the stock price gets a lot cheaper. So I think it is something to just watch as the price here at $2.40 is just below net current asset value. 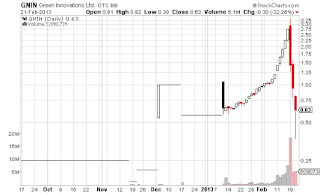 Short Watch Green Innovations (GNIN) Green Innovations (GNIN) traded over $7 million shares Friday and is currently going full zombie. It's up from $1.00 to $2.75 just this month. It's been running everyday and buying volume is eventually going to get exhausted. It's been volatile on the way up so it will be volatile on the way down. To short a momo stock like this it's a bad idea to short when it is green (positive) on the day. It needs to crack the previous days close before it is a short setup. The setup is going to be here very soon. Could even be Monday or Tuesday. Hello folks. 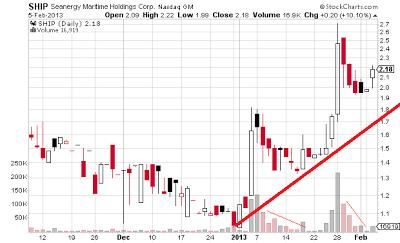 I put this shipper Seanergy Maritime Holdings Corp. (SHIP) up on Twitter about a week ago after the dry bulk shipper post. SHIP is a low floater. It has a small float and it only has a market cap of $26 million. It has run especially well along with all the other shippers. It's a really good one to trade because of how volatile it is. Very high day range. 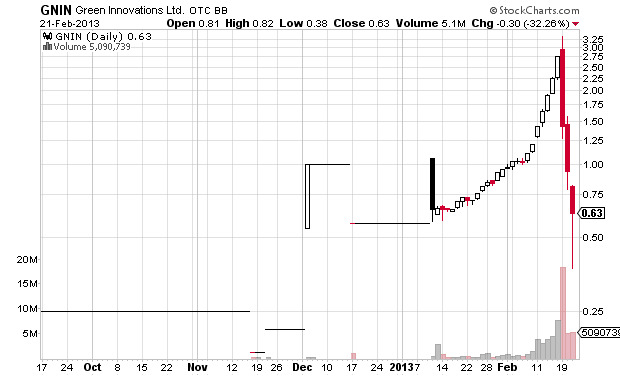 It had a huge run in January from $1.20 to $2.70 a share. It just printed a hammer off this new flag. Right now it definitely looks like another flag because of the decreasing sell volume I drew the red lines over.